PF secretary General Wynter Kabimba will not contest any parliamentary seat because he has failed to find a ´winnable´ one. Sources say his efforts to dislodge Given Lubinda in Kabwata have failed. But Party president Michael Sata has instead promised him a ministerial position and urged him to concentrate on organizing the party. Kabimba seems to have problems contesting in his home area due to unpopularity of his party. He hails from Central province in Mwembeshi constituency which was held by the UPND until last Thursday. 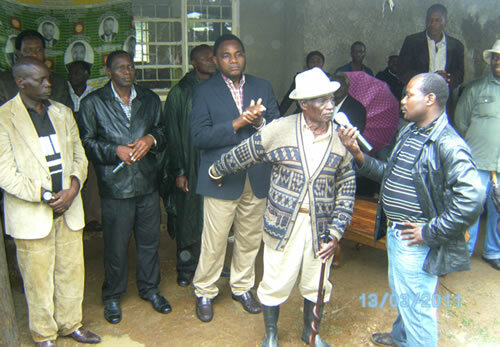 Kabimba´s father (wearing hat in the picture) is campaigning for UPND and has said so publicly. PF insiders had early this week indicated that Kabimba has been plotting to contest the Kabwata seat and relocate Lubinda to the Western province. The source told the Watchdog that PF leader Michael Sata and the entire central committee resolved not to adopt Kabimba for Kabwata constituency which was held by Given Lubinda until Thursday. Sources say Sata has consoled Kabimba by promising that he will be appointed legal affairs minister if the PF formed government. “The boss chose to keep Lubinda in the loop for Kabwata, but before that some senior party officials had wanted to have Lubinda contest in Western province and Kabimba in Kabwata. The decision to have Lubinda out of Kabwata created divisions within the party leadership in Kabwata,” said the source. The source revealed that Lubinda was also not comfortable to contest in Western province because of uncertainty in the growing political trends and division in the area. The source told the Watchdog that the PF leadership had wanted to get rid of Lubinda from the party by taking him to a constituency where he was not popular. “They wanted to do that because of the issues that are surrounding Mr. Lubinda, the issue of the email which was leaked to the Watchdog. And other issues,´ said a source. And one of Kabimba’s nephews confirmed to the Watchdog that Kabimba will not contest this year. “My uncle will not run for any parliamentary office, he has informed the entire family about his decision not to contest, he is not in politics for money or a job, he has already a job, he is a lawyer and I think he is comfortable with that,” the nephew who did not want to be named told the Watchdog. Efforts to get a comment from Kabimba proved futile as he could not pick his mobile phone.